Half Life 2 Survivor v2.0 Arcade Machine is an updated version of Half Life 2 Survivor, and features new weapons, a new battle map, and improved web service and online support. 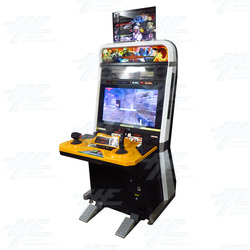 Half Life 2 Survivor v2.0 SD Arcade Machine is an arcade FPS, with the gameplay remaining faithful to the original arcade version. The machine features an innovative set of controls that allow for greater freedom and precision than the standard action shooter. The player controls consist of 2 joysticks. The Player controls consists of a 2 joysticks, the left is a short domed joystick. That can easier be gripped in the left hand, this is used for movement. The right joystick is modeled like a flight joystick, this is used for aiming and to look around the environment. Half Life 2 Survivor v2.0 SD Arcade Machine is an arcade FPS, with the gameplay remaining faithful to the original arcade version. The machine features an innovative set of controls that allow for greater freedom and precision than the standard action shooter. The player controls consist of 2 joysticks. The Player controls consists of a 2 joysticks, the left is a short domed joystick. That can easier be gripped in the left hand, this is used for movement. The right joystick is modeled like a flight joystick, this is used for aiming and to look around the environment.